Edward Byrne is a graduate of Brooklyn College, City University of New York (B.A., M.F.A. ), and the University of Utah (Ph.D.). He has won a number of awards and fellowships, including an Academy of American Poets Award, the Donald G. Whiteside Award for Poetry, and a Utah Arts Council Award for Poetry. His first full-length collection of poetry, Along the Dark Shore (BOA Editions), was a finalist for the Elliston Book Award. A chapbook-length collection of poems contained in The Return to Black and White (Tidy-Up Press) was selected by Library Journal as among "The Best of the Small Press Publications." Work in his third book of poems, Words Spoken, Words Unspoken (Chimney Hill Press), was awarded the Cape Rock Prize for Poetry in 1995. In recent years Byrne's work in editing the on-line poetry review, Valparaiso Poetry Review, and his critically acclaimed blog, One Poet's Notes, have added to the increasing acceptance of and respect for on-line poetic work. Aside from his two fine collections from Pecan Grove Press (East of Omaha and Tidal Air), Edward Byrne has a new collection of poems, Seeded Light, due out in early 2010 from Turning Point. In 2011, he edited a sampling of poems from Valparaiso Poetry Review (Poetry from Paradise Valley) to celebrate the first decade of that excellent, on-line literary magazine's existence. His poems also have appeared in numerous literary journals and anthologies. He was born in New York City and currently resides with his wife and son in Valparaiso, Indiana. He is a professor of American literature and creative writing in the English Department at Valparaiso University. 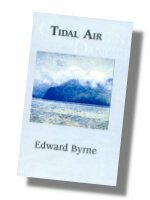 "Byrne does what only the best poets can do...he makes connections which go beyond the landscape that can be described in spoken words, and he points to those truths which can never be fully captured in language." You can learn more about Edward Byrne by visiting his personal web page at Valparaiso University where he teaches and edits Valparaiso Poetry Review. Do yourself an immense favor if you love poetry and visit "One Poet's Notes" on a regular basis. Edward Byrne is also the editor of Poetry from Paradise Valley (Pecan Grove Press, 2011) an anthology of sample poems from the first decade of Valparaiso Poetry Review.